The Apple App store hosts a huge collection of iOS applications and games. Many of us love to play the games available on iPhone but can’t enjoy them due to the unavailability of one. These apps are designed to run on iPhone or iPad devices supported exclusively by iOS. But chances are that people usually own android devices and some have even emulated this Android experience on their windows PCs. Let us start by understanding what these emulators are. Emulators are basic virtual machines that support applications of a system that run in different non-compatible machines. So, these environments simulate the conditions. For example, we can have an android emulator on a windows machine to run android apps which are originally not compatible with windows by default. So similarly, there are various emulators to emulate the apps of iOS devices on your Windows PCs. There are number of features of using emulators,some of them are listed below. Detect major issues in your app during testing and design. Test and develop iOs apps during its development stage. Here is a list of the best iOS emulators that you would love to use on your computers. iPadian is a free and popular iOS emulator for Windows PC. This one has a really cool interface and looks best. It helps in bringing multiple features of the apple’s new iOS 10 on the windows platform. The emulator has amazing capabilities to let you touch and feel the new iOS with amazing features like Siri and iMessages. It also allows you to watch OS and TvOS very easily. This emulator is user friendly and has many advanced features which are highly customizable. Many features are packed in one emulator and is ideal for the majority of the user population who like to have the most resemblance to an iPhone. iPhone simulator is a unique and different kind of simulator which not only lets you emulate the apps but also provides you with the interface of an actual iPhone. So, this comes in handy to try out even the default set of applications which are otherwise difficult to find on the store. Since this emulator comes with great graphics you can test iPhone features like clock, calculator and even the list of setting preferences. iPad simulator works as a Google chrome extension which can be accessed on Google chrome on Cloud OS. This simulator allows the user to experience voice assistants like Siri without the need to purchase an actual iPad. What more is that you can create your own apps in seconds and launch and connect to your favorite web services in a matter of minutes. MobiOne studio is probably one of the best emulators on this list that enables you to run all iOS games and applications for free on Windows PC. It basically works for developing cross platform apps between iOS and android platforms. This application is more synonymous with a developing platform rather than simple emulators. Smartface is both an iPhone app emulator and tester. This helps to develop apps on cross platforms for native iOS apps. This is an intelligent emulator with full debugging options and thus provides the app developer high flexibility to work with it and develop apps. Hence this one is better associated with a mobility management platform to reduce cost and increase productivity. Developers should watch out for this emulator as it helps to achieve multiple results at the same place. Appetize.io is an online iOS emulator to help run iOS apps and Android apps at the same time. So, you can consider this one as a two-in-one solution to all your app needs. The result is that there are a wide variety of apps available at the disposal of the user because of a single software. Also, it is a great tool for testing apps as a developer to test any app. App.io is a great iOS emulator which helps to run apps on it easily. For functions, such as app previews. Training, customer support, testing and demos etc. this is an almost ideal emulator available on the market out there. This emulator need not be downloaded and hence can be accessed directly online. All one has to do is upload .apk or .appi bundles on it to run it. Also, this application can stream mobile apps from the cloud to any device. The simulator itself requires no custom code. So, you just have to upload, stream and start using the app. AIR iPhone is an emulator by Adobe. It provides the iOS interface to run many iOS apps on it. It replicates the graphical interface of the mobile phone better than many other emulators. Even the dock apps are available for emulation on this emulator. You can even make calls, receive calls and voice messages from this simulator. Xamarian Testflight is a useful emulator with quite a user-friendly interface and a very advanced support. The simulator can be simply downloaded and installed on your Windows system to run iOS apps without any disturbances. The disadvantage of this emulator lies in limited access to Apple app store and no access to default apps. While there are many more simulators the list here is a collection of some of the best ones. In general, these emulators must be chosen to suit the needs of the user. Some users might need emulators for a simulation of the actual iPhone or iPad devices before buying them. Some others out there are developers looking to develop cross platform apps across android and iOS devices. While most of the users fall into third category of trying to use apps and play games of iOS devices since they do not possess an iPhone/ iPad. The other criteria for these emulators are its various forms of availability. Here again some emulators are available as downloadable software packages and some are available online as extensions. And again, whether the service is free or paid is also an important part of consideration. 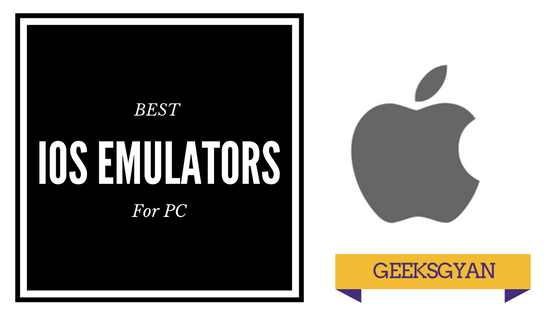 We recommend the above emulators as the list contains a mix of software to match everyone’s needs.